I've received a few awards lately, and had to come up with a total of seventeen items that people didn't know about me. 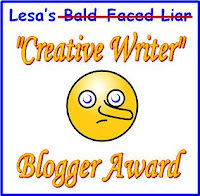 So, a regular reader here suggested that I give out an award, Lesa's Bald-Faced Liar, whoops, I meant to say "Creative Writer" Award. Anna even designed this award for me! Thanks, Anna! Now, I get to make up the rules. Most of all, since many of us have run out of items to tell about ourselves, have fun making up those outrageous stories! So, here are my outrageous truths and lies. Go ahead and guess. I'll tell you this afternoon which one or more are true. 1. 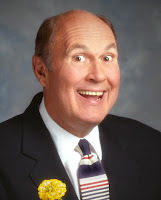 Willard Scott was one of my library patrons. 2. Jim Leyland, Manager of the Detroit Tigers, is my mother's second cousin. 3. 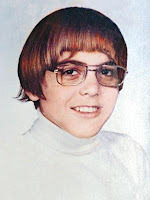 George Clooney was my first boyfriend, and he was as nerdy looking as I was. 4. My hometown is on Lake Erie. I saved a kid from drowning in the lake when I was in high school. 5. At a Mets/Marlins game, Jim paid for the billboard to flash, "Lesa Loves Mike Piazza." 6. I won first place at the state fair with the cat quilt I made. 7. Jim is my second husband. I met both of them at the library. So, which of these are true? I'll tell you if you're right later today! I think these seven bloggers can EASILY come up with seven outrageous stories. The women at Mystery Lovers Kitchen. You're all writers. I know you can come up with something creative! And, Jen? Consider yourself a winner of this award, but I know you're behind in your book reviews, so you don't have to come up with seven outrageous items. Love from my part of the world! Lies? At the Mystery Lovers Kitchen? Surely not! :) Yes, I think we can come up with a few. Thanks so much for the Bald Face Liars award! This was such a cool idea! There are 3 are the list that could be true and having a hard time deciding which one....Choice 1,2, or4....drum roll (lol) I pick Number 2 Jim Leyland is your mother's 2nd cousin. I know the truth, but I won't tell so I don't spoil the fun for everyone else! Christie (Lesa's sister) Did you want to do some of those things? The answers are going to have to wait for part of the day so I can see what people select. And, Christie? Heck, no. They were just some "bald-faced lies" that Jim & I picked out to put on the blog. Elizabeth, I'm sure between all of you, there are a few bald-faced liars, ahem, sorry, creative writers who can come up with some ideas. Remember! At least one has to be true! Fun award, huh, Kathrin? Anna said she knew I was having a hard time coming up with more interesting things to say about myself, so she suggested a new award. Love back to you in Germany! Mash1195 - Very good choices! I'll let you know later today. Les - You should see my freshman picture! I look just as nerdy as George. I'll let you know later! Well, Lesa, this is just the most fun ever! Thank you for including me in this, and I'm gonna have a grand time coming up with my list. I'm going to take a guess that your one item of truth in your list (which I love!) is that Jim paid for the billboard message. I hope I'm right, but if I'm not let's get him to do that 'cause it just sounds like a Jim & Lesa kinda thing!! Can't wait to see your list, Kaye. I just knew you'd have a fun time coming up with it. I'm going to guess that you won first place with your cat quilt! Give me a few days to come up with some tall tales. I hope Jim's doing better. OK, Lesa, I'll bite. I think #1 might be true. Hmmm...I'm not sure how good I am at coming up with tall tales, especially about myself. My life has been completely non-outrageous. I'll have to consider on this for a while. No hurry, Kathy. I just ran out of interesting things to say about myself! That's OK, Kay. I know how hard it is to participate sometimes. Don't worry over it. I just found it hard to continue to come up with interesting items, so Anna suggested I make things up. What a fun award idea! I'm going to guess that 6 (the cat quilt) is the true one. Thanks, Ingrid! As I said, it was Anna's idea. I'm going to reveal the answer before I leave to take Jim to the doctor today. Lesa, I LOVE this award! What fun! You met George at the library?! Love it, Krista. It reinforces all my beliefs in him to know he was in the library. Anna is going to be so pleased that everyone loves the award! And, I'm sure you can come up with a couple good tales for Mystery Lovers Kitchen! OK, everyone. I'm on my way home to pick up Jim, so here are the answers. And, the quilt? My mother actually made that, and the flowers were a gift, so I thought it might throw you off-track. And, now we all know that Krista Davis actually met George Clooney at the library, and he's her boyfriend! I should have known! From your tales about Jim, he's the kind of guy who would do that :D And yes, awesome!!! I'm very flattered to be awarded with this, Lesa. Thank you very much for this, my friend! This idea is truly inspired and sooo much fun. You know, I actually guessed right on two of these before I read your reveal. Thank you for the award, Lesa! The mystery writing cooks at Mystery Lovers Kitchen are cookin' up whopping fish tales as I type this. You're right, Kathrin! Jim's a pretty special guy. You're welcome, Le0pard13. I hope you have time to do it. Should be interesting! Can't wait to read the other lies. Fun idea! What a great idea! This reminds me of an icebreaker from The Sylvia Beach Hotel on the Oregon coast called Two Truths and a Lie. It was played during dinner where the food was served family style at long tables. People could ask you questions before voting on your lie. It was creative and fun like your award. Thanks, Janet. Anna's idea was fun. I like that idea of an icebreaker. I'm sure it was an interesting way to meet people. Thanks for saying my award was interesting and fun! And, Krista needs to talk to George about taking other women to Award ceremonies. I saw him on the red carpet at the Golden Globes, and Krista should have been there! She must be keeping a low profile, so their relationship isn't all over the tabloids. Imagine how much more popular George would be if everyone knew he was dating Krista! Fun award Lesa. I'm guessing the truth is Jim is your second husband and you met him at the library. Thanks, Diane! And, I see Kay passed it on to you. Have fun! Nope. Half a truth. Jim's the only man I've ever been married to - it was 26 years in October. But, we did meet at the library. I'll be checking it out, Cathy. Have fun with it! I finally posted my lies! It took me long enough. Thanks for playing, Kathy. You had some terrific comments! Hi Lesa, I'm a (possible) neighbor of yours and also a fellow blogger. I was just awarded your Bald Faced Liar/Creative Blogger award. I googled the award to find out the genesis of it and was pleasantly surprised to see that it originated right here in Arizona, and just one town over from where I live! I'm just popping in to say hello and thanks for creating the award. It took some work to fulfill the duties, but it was a lot of fun! I'm enjoying your site and hope our paths cross some time soon. I apologize that I never commented on your note. It came in on the day my husband died, so naturally it was buried under so many other issues. I think it's fun that you received the award, and you're here in Arizona. I don't know if you're a mystery reader, but perhaps we'll run into each other at the Poisoned Pen sometime. Thanks for saying the award was fun!